The powerful cliffhanger: The Best of Both Worlds Part 1 and 2 has been fully restored in brilliant 1080p HD and seamlessly edited together into one feature-length presentation ... and the crew of the Enterprise is asked: How do you stop an unstoppable foe? The Enterprise team discovers the devastated remains of a Federation colony as an ambitious young officer joins the crew to confirm the presence of the deadly Borg. 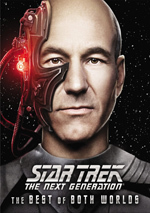 Soon after, Borg drones abduct Captain Picard, mutilating him horribly as they assimilate him into their collective. Commander Riker must take over as Enterprise captain as Steerfleet braces for an all-out battle to defend Earth. But the Borg's power proves overwhelming, and resistance is futile. Will Riker be forced to destroy his former captain to save Earth and the Federation? Spanning the series’ Third and Fourth seasons, “Best of Both Worlds” became the first-ever Star Trek: The Next Generation cliffhanger. Updated with new effects and re-edited to create one uninterrupted film, this 2013 Blu-ray lets us take a fresh look at “Best”. The Best of Both Worlds, Part I: The Enterprise receives a distress signal from one of the Federation’s most distant colonies. When they arrive, they find nothing where a town used to be. Suspicions immediately arise that the Borg caused this disappearance. To investigate this event, Admiral Hanson (George Murdock) and Commander Shelby (Elizabeth Dennehy) come aboard the Enterprise. Shelby proves to be very ambitious, and she seeks the position it appears Riker may vacate for the captain’s chair elsewhere. This leads him to question his own decisions, as he doesn’t understand his reluctance to leave the Enterprise. When eventually the Enterprise meets up with the Borg, they provide a peculiar demand: for Picard and Picard alone to leave the ship and come to their Cube. He refuses and battle ensues. Thanks to a tactic thought up by Shelby, they manage to break free of the Borg grasp long enough to escape, where they enter a dense nebula to evade them while they regroup. Eventually the Borg break through, abduct Picard, and set a course for Earth. Like many Trek programs, “Best” places the Enterprise in an apparently unwinnable situation against an apparently unbeatable foe, and it requires their collective ingenuity and bravery to save the day. “Best” packs a nice combination of cleverness and action. This becomes one of the series’ strongest efforts. Star Trek: The Next Generation appears in an aspect ratio of approximately 1.33:1 on this Blu-ray Disc. I’ve been pleased with the other HD TNG I’ve seen, and “Best” continued that trend. These remained non-intrusive, though, and the image appeared to lack digital noise reduction; I saw a fine, appropriate level of grain. Source flaws failed to create concerns, as the episodes lacked specks, marks or other problems. In terms of colors, “Best” tended toward warm, earthy tones, and they looked terrific. The hues were consistently full and rich, without bleeding, noise or other issues. Blacks seemed tight and dark, and low-light shots displayed good clarity and smoothness. Only the slight edge enhancement created any kind of complaint; otherwise, the shows looked excellent. More praise accompanied the DTS-HD MA 7.1 audio of “Best of Both Worlds”. With a higher action emphasis than much TNG, the soundscape managed to offer greater involvement than usual. Ships zoomed around the room and phasers fired in appropriate locations. Music and atmosphere also came from the surrounds and added good integration to the settings. The elements came together in a lively, engulfing manner. Audio quality seemed strong. Speech was concise and natural, with no edginess or other distractions. A few louder effects distorted slightly, but they usually offered strong clarity and punch; bass response could be tight and dynamic. Music was also full and bold. This was a very nice soundtrack. The disc throws in a few extras. New to the Blu-ray, we get an audio commentary from director Cliff Bole, actor Elizabeth Dennehy and scenic artists/Trek historians Mike and Denise Okuda. All four sit together for this running, screen-specific look at aspects of the two-part episode and its connection to greater Trek lore. For the most part, this becomes a decent but unexceptional chat. Bole and Dennehy let us know about their day-to-day experiences on the show, while the Okudas give us a take on the bigger picture of TNG. We learn a reasonable amount but the track never really takes off in a dynamic way; it’s well worth a listen but don’t expect tons of insights. The text commentaries the Okudas have prepared in the past offer more bang for the buck, honestly. A new featurette called Regeneration: Engaging the Borg lasts 29 minutes, 40 seconds and includes notes from Dennehy, Bole, Family Guy creator Seth MacFarlane, technical consultant Sternbach, makeup supervisor Michael Westmore, producer David Livingston, Free Enterprise writer Mark A. Altman, visual effects coordinator Gary Hutzel, model maker Greg Jein, composer Ron Jones, and actors Jonathan Frakes, Marina Sirtis, Michael Dorn, LeVar Burton, Brent Spiner, Gates McFadden, and Patrick Stewart. We learn about the design/development of the Borg, story/character areas and the challenges of a cliffhanger, makeup and effects, cast and performances, music, and the episode’s legacy. At times, “Regeneration” becomes redundant, mainly when we hear from Dennehy; she repeats a lot of the info from the commentary. Otherwise, the show works well. It covers the appropriate bases and provides a nice overview of the program. Next comes a Gag Reel. It goes for five minutes, 28 seconds and provides the usual flubs and giggles. Fans may enjoy this. The disc opens with ads for Next Generation Season Three and Enterprise Season Two. We also find episodic promos for both parts of “Best”. Among the strongest episodes Star Trek: The Next Generation ever produced, the two-part “Best of Both Worlds” fires on all cylinders. It mixes action and drama to create a satisfying piece without any notable flaws. The Blu-ray gives us excellent picture and audio along with a few useful bonus materials. As much as I enjoy “Best”, it becomes tough to recommend this Blu-ray. Most fans will also buy the Season Three and Four sets that will include “Best”, so that renders this disc superfluous – unless they really want to see it edited into one single show. This Blu-ray also comes with some supplements that won’t appear in the season packages. If those extras and the seamless version really appeal to you, the Blu-ray will be worth its cost, but I suspect most will not find it to merit its expense.